Law enables behavior. It creates incentives to act in certain ways or provides cover that allows people to act. More often than not this legal functionalism is positive, but in others not so. The shooting of Michael Brown in Ferguson, Missouri, in part, is a story of how law and public policy have incentivized police to use military style force, often times with racial animus. Prior to the Civil War, only a few American cities had police. Post Civil War, policing grew along several fronts. There were the Pinkertons, created as private police to bust unions. In the south, police departments emerged to maintain order against the freed slaves. In the north, they grew to check immigrants and unions. In the beginning of the 20th century, reformers such as August Vollmer sought to professionalize the police by reforming its structure and organization along a military model of authority and hierarchy, creating uniforms and command structures that exist to this day. From its early days then, policing in America was clouded both with a racial and military overtones. 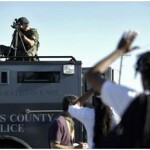 Yet the modern militarization of police in America owes it origins to several events. First, reaction to the urban riots of the 1960s led to President Johnson signing into law the Omnibus Crime Control and Safe Streets Act of 1968. The Act created the Law Enforcement Assistance Administration, which made available grants to local governments to develop and purchase military-type resources to suppress the riots. The money facilitated the development of SWAT and other heavily armored police forces that had developed in Philadelphia, Los Angeles and other cities to counteract so-called black insurgency. Second, President Nixon’s declaration of the war on drugs and its reemphasis by Ronald Reagan further enhanced the militarization of the police. It did so in its rhetoric–the war metaphor sanctioning that a military style response was needed to address drugs. There was also a racial overtone underlying the war against drugs was. The urban riots of the 1960s and drug usage were often associated with blacks. As seen later in the punishment differentials between drugs such as crack and cocaine, minorities were more heavily punished and incarcerated than whites. Third, the war on drugs encouraged the police use of civil forfeitures, which is the confiscation of property of convicted and sometimes suspected drug dealers. The theory was it would take the profit out of crime and prevent drug dealers from using their money to enrich their businesses. Civil forfeiture was upheld by the Supreme Court in 1996 which gave local police departments the money to be able to purchase even more military equipment from the Pentagon. Fourth, the events of 9-11 and reaction to it led to the collapse of the distinction between criminal policing, intelligence gathering and protection of national security. Laws such as the Patriot Act effectively turned the police into agents in the war against terror. Thus providing a war metaphor to support aggressive policing and new resources, through the creation of the Department of Homeland Security, to fight with military style weapons. Finally, the Supreme Court has constructed a legal structure that generally immunizes the police from civil liability in the use of deadly force. The 1985 Supreme Court case Tennessee v. Garner considers the use of deadly force a Fourth Amendment search and seizure issue. Police use of force to determine civil liability implicates a balancing test–one must balance the nature of the intrusion on the individual’s Fourth Amendment right against the government interests to justify the intrusion. A suspect’s interest is substantial–a desire not to die. To overcome that interest, police must show that they believe that the suspect poses a threat of serious physical harm to officer or others. To be considered immediate and serious, a suspect must be armed and mere possession of a weapon (or belief thereof) is enough. While in theory such a test would seem to be a deterrent to the use of force, the reality is that few police are charged and convicted of use of deadly force. In effect, civil liability does not really deter use of deadly force, thereby enabling the type of behavior one saw in Ferguson, Missouri. Additionally, rarely are police criminally charged for excessive use of force. Thus, a variety of legal doctrines and policies has encouraged a military style mentality and set of operations when it comes to policing. According to The Economist, in 2012 there were 409 deaths in the United States due to police shootings. There were only eight in Germany. None in Great Britain or Japan. Given the incentives created by the law, it should come as no surprise that America has enabled the police to use the force they did in Ferguson, Missouri. The only surprise is the degree of press and visibility it has received. There are hundreds if not more Michael Browns who have existed, and the question now is what America will learn from this latest tragedy.